Excel 2016 is regularly updated via semi-annual updates. These often add features to Excel. We regularly update our videos to match the current Excel 2016 version. If you downloaded your e-book some time ago it is possible that your book is referencing an older release of Excel. You can download a fresh copy at any time from the free link above. Yes. 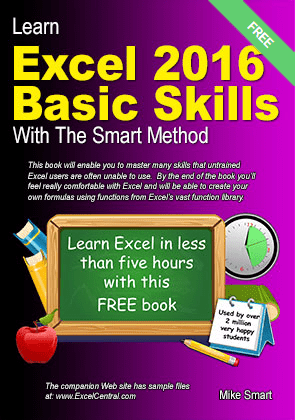 We publish a FREE Excel Basic skills e-book for all Excel versions in common use (including Apple Mac versions). You can download our other free Basic Skills e-books here: Excel 2007, Excel 2010, Excel 2013 and Excel 2016 for Apple Mac. Which version of Excel was used to record these videos? The January 2018 semi-annual update (version 1709). This version was also released to Semi-Annual (Targeted) channel on Sept 12, 2017 and to the Monthly Channel on Sept 18, 2017. You can learn more about update channels in the free Basic Skills book (Lesson 1‑2: Check that your Excel version is up to date). The Basic Skills course contains the first 43 lessons in the Essential Skills course and will take most users 5 hours or less to complete. Free Basic Skills books are also available for Excel 2007, Excel 2010, Excel 2013 and Excel 2016 for Apple Mac. It is important to realize that the videos are not useful as a learning resource on their own. This is because it isn’t possible to learn Excel 2016 from a video tutorial for the reasons explained in this article: Why you can’t effectively learn Excel 2016/365 using a Video Tutorial. You should download the free Basic Skills e-book (and print it if you wish) before viewing any of these walk-through videos. Work through the lessons in the free Basic Skills e-book. You should always try to complete each lesson using your book and only consult the video if you have difficulties completing the lesson, to identify where you are going wrong. Each video shows one of our Excel consultants completing a lesson from your book. Why you can’t effectively learn Excel 2016/365 using a Video Tutorial. I’ve also added a link to this article to the page above in case any other reader has the same question. After reading the article you’ll understand why it isn’t possible to record an Excel 2016 Video Tutorial as a commercial product. Instead we’ve produced the Excel 2016 video walk-through videos and given them away for free in the hope that they will be useful to learners using the book/e-book (but only when they have difficulty completing a lesson). Originally they were silent but we had a request to add “text-to-voice” to help visually impaired users. You can mute your speaker if you find this irritating. When I click Download Sample Files, I get a message that says “Smart screen can’t be reached right now. Check your internet connection. Windows Defender smart screen is unreachable and can’t help you decide if this app is OK to run. It then gives me the option ti run or cancel. When i select RUN, nothing happens. This stops me in my tracks for the tutorial. This is for the Basic Skills 2016 book that does not have an ISBN#. Windows Defender is the built-in “anti virus” component of Windows. The message you’re getting seems to suggest that there is something wrong with Windows Defender on your computer so it is protecting you by refusing to run any downloaded programs. ZIP files are not programs so they shouldn’t be blocked by Windows Defender. To extract the files from the ZIP file, right-click on it and click Extract All from the shortcut menu. When using “the navigation arrows or search box below to navigate to any of the thirty-eight free Excel 2010 Basic Skills video lessons in this course” the navigation buttons will not move you on from (2010 Essential Skills Lesson 01-05 Save a workbook 2m 32s) – the page reference changes but the video tutorials do not, so I am unable to access the remaining 32 free Excel 2010 Basic Skills video lessons. I have tested the gallery using the latest versions of the Chrome, Edge and Firefox browsers and it seemed to be working correctly. If it isn’t working with your browser, I would suggest making sure that it has been fully updated and trying a different major web browser if it still isn’t working correctly. It’s also possible that you have a browser plugin (such as NoScript) that is preventing the gallery from working. If this is the case you may need to disable the plugin or configure it to allow the gallery’s scripts to run. Finally, there’s always the possibility that the problem was caused by a temporary outage on one of our servers. If this was the case it should have been resolved already and everything should now be working. I have windows 10 & am using Word 2013. Will Excel 2016 work with 2013? I understand that 2016 is the latest version of Excel. Am I wrong in assuming that using the latest version makes the most sense? I am interested in knowing the basics so that I can use Excel for personal use. But not for formula calculations. Ideally you should use the course that matches the version of Excel that you are using. If you are using Excel 2013, you should use one of our Excel 2013 courses. If you’re unsure about whether the course will work for you, you should start with the free Basic Skills course. You don’t need to pay or register to use this, you can download it and get started straight away. Basic Skills is available for Excel 2007, Excel 2010, Excel 2013, Excel 2016 and Excel 2016 for Mac, so it should be easy to check which course is right for you. If you’re not sure which version of Excel you are using, try following the Excel 2016 course. One of the first lessons in the course will show you how to check exactly which version of Excel you have. Please help- how come I do not have sound with my tutorials? All videos should have sound if you’re using them on this website (thesmartmethod.com). If you’re having audio problems you can find some advice on this page. Hi would you please tell me if i can download free videos tutorial for basic skills excel 2016? We offer free video walkthroughs for Excel 2016. You can find them on this page. The videos are designed to be watched online and cannot be downloaded. The video walkthroughs aren’t intended to be used as a standalone video course, and are meant to be a supplement to the printed books or e-books.